Exhilarating guarana shower gel to wake up mind and body. Rapid mood-changer to help calm, de-stress and re-balance. 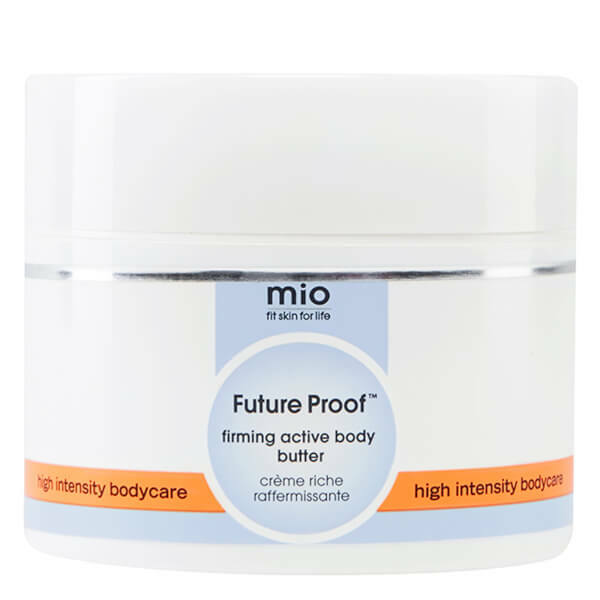 Experience unrivalled moisture with Mio Skincare's Future Proof Active Body Butter, a heavy-duty body butter that works to replenish and hydrate super dry skin. Packed full of moisturizing properties, including organic shea butter and hyaluronic acid, the rich butter helps replenish the moisture in ultra-dry patches whilst its nutrient-rich ingredients help skin feel thicker, more resilient and mega-moisturised. Delivering intense hydration, the body butter effectively counteracts dryness and can promote elasticity, enhancing the appearance of skin bounce whilst delivering superfood nutrients for glowing, future-proof skin. Free from parabens, petrolatum, colorants, xenoestrogens, PEGs, glycols and phthalates. Try using on shower damp skin, to help seal in extra moisture. Once a day is plenty; this super strength formula will give you 24-hour hydration. To reap maximum benefits, use deep, upward strokes toward the heart. Aloe Barbadensis Leaf Juice, Cyclopentasiloxane, Aqua, Glycerin, Caprylic/Capric Triglyceride, Prunus Amygdalus Dulcis Oil, Butyrospermum Parkii Butter, Cetyl Alcohol, Glyceryl Stearate Citrate, Cetearyl Alcohol, Caprylhydroxamic Acid, Glyceryl Caprylate, Sodium Stearoyl Glutamate, Olea Europaea Fruit Oil, Punica Granatum Seed Oil, Argania Spinosa Kernel Oil, Sodium Acrylate/Sodium Acryloyldimethyl Taurate Copolymer, Isohexadecane, Polysorbate 80, Moringa Oleifera Seed Oil, Vaccinium Corymbosum Seed Oil, Cocos Nucifera Oil, Hyaluronic Acid, Parfum, Limonene, Linalool, Citral, Citronellol, Evernia Furfuracea Extract, Beta Glucan, Tocopherol, Ganoderma Lucidum Extract. Hands down the very BEST body Butter cream EVER! Living in the dry hot desert wrecks the skin. I love this cream because it keeps my skin moisturized throughout the whole day and makes me feel beautiful. The smell is very calming and the butter is very refreshing. Totally addicted to this stuff. It is worth EVER penny. I'm 63 and have using this for about a yr now. I have super dry skin plus growing up on the beaches of So Calif did its damage. This is my favorite cream. Also I like it that it comes in a larger more for your money jar especially because i use it over my whole body. You dont need much even with dry skin as it absorbs well but is rich without being greasy. On my face, neck, upper arms and upper chest I first use the Skin Tightening Serum, which is super even on its own and also you only need a tiny bit. So i find these two products are my favorite together and alone. Excellent for dry winter skin! 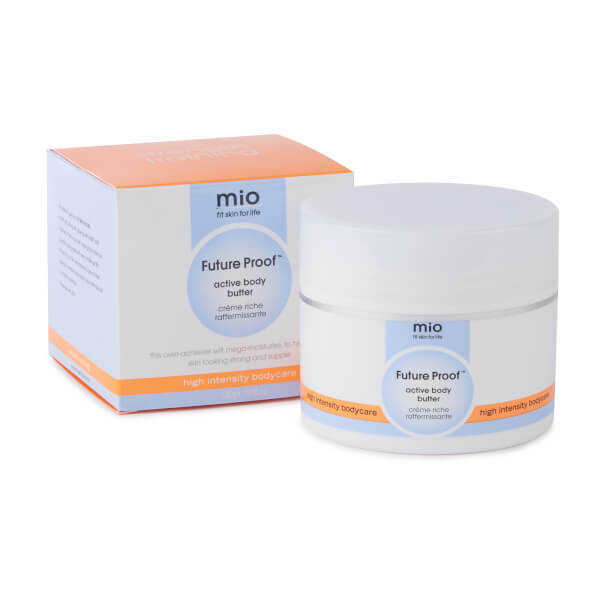 I have tried other Mio products (Skin Tight and Shrink to Fit) and recently tried Future Proof Active Body Butter. It has surpassed my expectations! I love the scent which is very pleasant and not too strong. The body butter goes on smoothly, is not greasy and has really helped reduce extreme dryness on my legs. It's so nice to have a product that I really enjoy using-I love it!! I love Mio Skincare. I think future proof has said my skin from this winter. I was obsessed with the tummy butter when I was pregnant and now I am obsessed with future proof. I literally have seen a change in my skin after one tub. This stuff is wonderful! I used Mio products when I was pregnant and they worked so well that I continued using them after! Superb for dry skin!! Love this product. Smells fresh and keeps my skin moisturized and soft all day. Have ordered it over and over! I am fairly picky about my skin products. I have a certain preference in terms of texture and scent. It can't be too thick and gloopy because I tend to overheat quickly, but it can't be too thin and greasy either, because I find it doesn't moisturize enough. Enter Future Proof. The most amazing product for colder months. Apply this once a day, immediately after a shower. It sinks in right away, and your skin feels soft and smooth all. day. long. And the scent! I'm incredibly sensitive and allergic to smells, so I've been using unscented products for over a decade. In addition, I work in the medical field and cannot have my scent enter the exam room before I do. So I was a little hesitant about this. However, the smell is just as described - gorgeous! - and is very light, with only myself or my significant other getting a breath of it. I'm thrilled I had this to hold me over for the end of winter into spring. I just ran out, and while I know it'll be too thick for my skin for warmer months, I'm anxiously awaiting both the lotion and oil to come my way as seasonal replacements! My only (minor) gripe is that for a large 8oz tin, me and my wallet was hoping it would last longer than 6-8 weeks. Totally worth it though. Thank you Mio!